The lack of oxygen in space means that a fire on a spacecraft is rarely a problem for long. As soon as the outer shell is breached, all the air rushes out and the fire is quickly extinguished. But that's not much consolation if you're an astronaut. You needed that oxygen to breathe. So space agencies around the world tend to take great pains to stop fires from starting in the first place. Except for Nasa - which has begun starting fires on purpose. The US space agency's Glenn Research Center in Cleveland, Ohio, was tasked with finding out a little more about what happens when a spacecraft does catch fire. So it set fire to one. 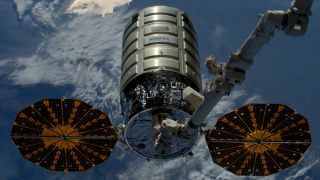 Specifically, an Orbital ATK Cygnus cargo vessel that had just finished a delivery mission to the International Space Station. After its supplies had been offloaded and replaced with trash from the ISS, the capsule was cast adrift and the experiment began. Inside a 3x3x5 foot box, engineers on the surface remotely set fire to an unspecified "sample material", while capturing images and data from multiple sensors. The flaming spacecraft whizzed around the Earth for eight days collecting data before burning up (in the atmosphere, rather than as a result of its onboard fire). In the coming weeks, researchers at Glenn and ten other international government agencies and universities will pore over that data. What they're particularly interested in is how fire behaves in microgravity. On Earth, a characteristic flame shape is formed because the hot, flammable gases become lighter than the surrounding air and rise. In orbit, where gravity is much lower, that doesn't happen to the same degree. "The success of this experiment opens the door to future large combustion experiments in the microgravity environment," said Gary A. Ruff, NASA's Spacecraft Fire Safety Demonstration Project manager. "It directly supports the development of technologies and materials that will make deep space exploration spacecraft safer."